Crandall Sheet. Geology Sheet XIV. 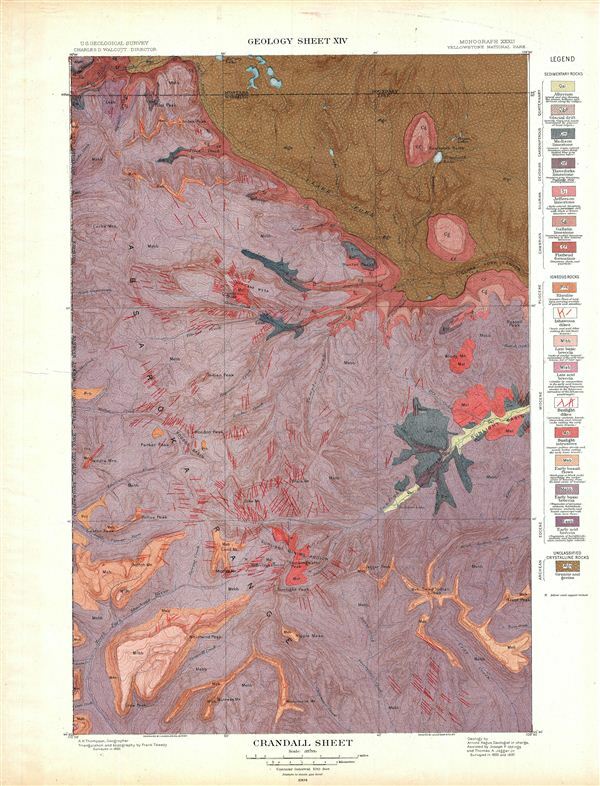 A fine example of Arnold Hague's 1904 geological survey map of the spectacular Crandall Region in the Yellowstone National Park, Wyoming. Centered on Crandall Creek, the map covers the Absaroka Range from the Crow Peak to Kersey Lake in Montana. The map identifies various creeks, mountains, peaks other sites of interest throughout. The boundary line between Montana and Wyoming runs along the breath of the map on the top. This particular map was part of Hague's study of the regions unique geology and the related geothermal activity. The map is color coded to identify different geological zones with a detailed key to the right side of the map proper. Published by the United States Geological Survey in 1904.